The branched-chain amino acids -- leucine, isoleucine and valine -- are three of the eight essential amino acids you must obtain through your diet. They share a similar branched shape, which sets them apart from other amino acids, but they’re still used to produce proteins in your body. They also fill roles that support your muscles. You can count on getting varying amounts of all three amino acids from protein-containing foods. The best sources of BCAAs are meat, chicken, fish, dairy products and eggs, reports NYU Langone Medical Center. 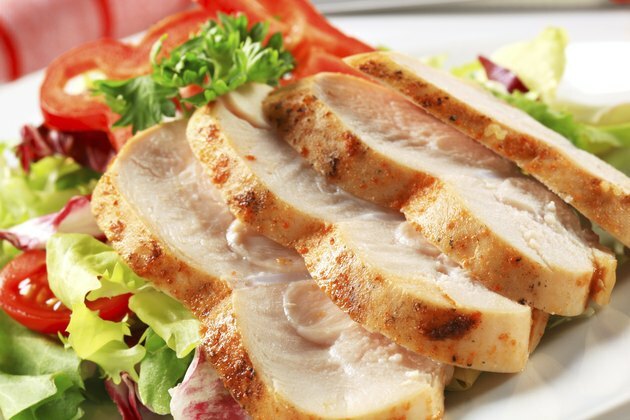 As a guideline, you can figure on consuming about 1.7 grams of leucine and 1 gram each of isoleucine and valine from a 3-ounce serving of meat, poultry or fish or from 1/2 cup of cottage cheese. A cup of milk contains about half that amount. Whey protein is another good option for boosting your intake of BCAAs. Soybeans, baked beans, lima beans, lentils, brown rice, whole wheat, corn and nuts such as almonds and cashews are good sources of branched-chain amino acids, reports the Huntington College of Health Sciences. Of all the plant-based foods, beans have the highest amount of total protein, so they're the best choice for BCAAs. One cup of vegetarian baked beans has about 1 gram of each of the BCAAs. By comparison, 1 cup of cooked brown rice and quinoa have 0.4 gram of leucine, 0.2 gram of isoleucine and 0.3 gram of valine. The recommended dietary allowance for leucine is 42 milligrams for every kilogram, or 2.2 pounds, of body weight. You should get 19 milligrams per kilogram of isoleucine and 24 milligrams per kilogram of valine. Healthy people can get enough BCAAs by consuming their RDA for total protein, which is 46 grams daily for women and 56 grams for men. If you’re sick or injured, you may need to boost your BCAA intake. Therapeutic dosages range from 1 gram to 5 grams daily, reports NYU Langone Medical Center, but talk to your health care provider if you have any concerns about your protein intake.